Born in 1963 in Cali, Colombia, Diego Velez is a self-taught painter who began painting at the age of 6 years old. Velez is always eager to create something beautiful. Many times the ideas for his artwork come from dreams and from looking at a blank canvas, realizing his desire to give something to the world that will be eternal. ​The process of color choice brings each painting to life and the brightness of colors creates power and presence. His paintings explore the universe and the ever-changing earth from both natural and human causes through abstraction. He is a firm believer in never leaving a piece unfinished and being part of the process from start to finish. Velez's works are all original complete creations from stretching the canvas, mixing the colors, and framing the paintings himself. 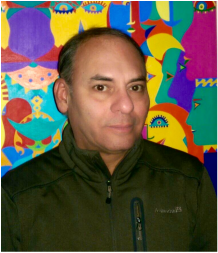 Velez spent time mid-career as an apprentice to Omar Rayo and has showcased his works at various Colombian galleries and museums and throughout South America and the U.S.
Velez is currently a resident of Massachusetts.